Waahh ... heck his name is really late post, this cupcake made ​​almost a month ago already fit kaka Kayla's birthday February 13 last month. Request kaka Kay When asked what would asking want to use fondant cake itself like playing play doh he said. Alhamdulillah simple request, but because nobody likes baseball home-made fondant cake I made cupcake eventually wrote. This time again want to make a cupcake that is moist, use google searching on the keyword 'moist chocolate cupcake' immediately sprung many cupcake recipes. See his pic I was intrigued by the recipes of foodess.com in this recipe uses cream cheese frosting and oreo pieces on it, whereas if I do not wear make frosting just add oreo biscuit pieces in the batter. The result is a real cupcake moist texture of the cake really moist and slightly dense aroma of coffee there. If you want a more pronounced chocolate flavor can replace coffee with milk chocolate water. If I make it good to eat oreo cupcake gini aja not wear anything else but if you want a more powerful tablets can be added nutella, must add it feels really special. This recipe I have translated and adapted as best I can with the material that is if you want to see the original recipe can be found here yaa. Oreo biscuit, break into 4-6 parts. Sift flour, cocoa powder, baking soda and salt mixed in a container and add the sugar and stir well. Mix together eggs, buttermilk, melted butter and stir well vanilli powder. Pour in the flour mixture and beat with mixer until well blended about 3 minutes. Turn off the mixer. Add the hot coffee and stir with a spatula until the dough is mixed. The dough will be wet and liquid. Pour in a paper cup, give oreo pieces and bake for about 25-30 minutes or until the surface is dry and elastic when pressed. Remove and let cool in a wire rack. 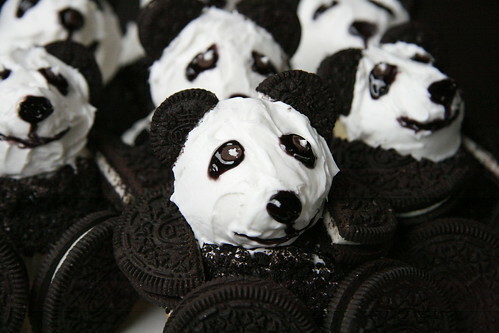 0 Response to "CARA MEMBUAT DAN RESEP CUPCAKE OREO PANDA DENGAN MUDAH "